This activity is available for both Marias Pass and Marias Pass 3. Its goal is to take a freight from Shelby to Whitefish, using some helpers available at Cutbank and which should be dropped off at Essex over the other side of the pass. However, it has some good traffic as well as spending some time at some red signals while awaiting east bound traffic to clear the line. The only problem you'll experience with this activity is safely negotiating the bad track at Cutbank. For that reason, webWiz only used the activity with passenger consists after the first broken coupler incident but recently took the easy way out, namely increase the Break values to unrealistic levels for a couple of locos and some rolling stock. Having used the Road Freight, Second Section activity by Flarrfan to bring a 12,000 ton coal load from Whitefish to Shelby, there was a certain amount of determination to do a similar trip westward. If you haven't previously used ConBuilder and ActivityChanger to add variety to activities, read about some ideas here. If you use ActivityChanger to alter the times and/or weather, you need to look for the activity file njwall.act in the activity files list under either the Marias Pass 3 route, Marias3, or the default Marias route, USA2. The first heavy consist that webWiz made was headed by 3 SD75MACs and 2 SD70MACs. 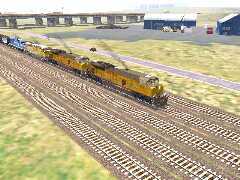 These locos hauled 80 BNSF coal wagons to give a load of about 12,000 tonnes with a train length of 1300 metres or so (bnsfcoal.zip 880kb, 17-Oct-01, from the Train-Sim.com file library). You could use any other coal wagon, such as those from TrainArtisan as part of their SD70 loco set. The locos had sufficient power to haul this load but insufficient braking power to keep to the speed limit on the down grade from Java! webWiz decided on replacing the SD75s/70 with heavier locos in a new consist: three SD90MACs and an SD80MAC. Using these more powerful locos, the theory is that more braking power will be available. At this stage, we're just past Cutbank so the real fun is yet to start. Using a consist of 80 or so wagons of the same type eases the pain of editing the WAG file to change the Break parameter value. As well, using only a couple of different locos eases the editing pain. You can see we've increased the breaking force by a factor of 5. In some cases you may not need to make this change, e.g. Train Artisan's SD70 locos and hoppers. Remember to save each file after the edit. You can see how the edit job is simplified by using multiples of the same loco so there's only one ENG file to edit. Similarly, using only one wagon type in your consist means there's the one WAG file to edit. Now it's time to start heading west! Remember your train has a 12,000 tonne load and is about 1300 metres long. That makes it completely different to manage over Marias Pass or Marias Pass 3 than, say, the Empire Builder with six Superliners. At some stages, your locos with the front half of the wagons will be travelling up grade while the rear of the train is on a down grade, and vice versa. Don't be in a rush to Blackfoot - you'll have to stop for a clear line for as much as 20 minutes if you're fast (not really possible with 12,000 tonnes!). It's a long drag for much of the trip to Blackfoot - in fact to Glacier Park - and there's plenty of work at notch 8 at about 30-40 mph. After the second approach to Blackfoot, there's only about 0.8 mile to the red - it doesn't show up on the Track Monitor until you've passed the second approach. So at the second approach, have your speed down to about 20 mph so you can roll up to the red at about 4-5 mph - it's fairly level, with a touch of down grade - so you only need a touch of brake to stop. You can avoid a difficult stop at Bison West by rolling along the Bison siding (which begins at Bison East) on notch 4 at about 4-5 mph. You should then have a meet with an eastbound freight somewhere along here if you take it slowly. Most of the trip after Summit was done with the brakes on continuous service and adjustment of the dynamic brakes to keep a speed of about 10 mph, up to 16 mph maximum, until Essex.